The 7th and final step to creating the marriage you want is to have a "Sense of Shared Meaning." By this I mean you need to have "rituals, goals and roles" that you share. Successful couples realize they must help their partner realize important life dreams and become effective at making each others life dreams and aspirations come true. In short: Help each other win. Successful couples accept influence from each other. Meaning they listen to, and seek out each other's opinions before making a decision. This is particularly hard for most men and some women. So men please don't feel like I am picking on you in this blog post. I am a man myself; I know how difficult it is to do what I am saying here. Successful couples turn towards each other instead of away. Real life romance is fueled by a far more humdrum approach to staying connected. It is kept alive each time you let your spouse know he or she is valued during the grind of everyday life. This means they retain some fundamental sense that their partner is worthy of being respected and even liked. Fondness and admiration are two of the most crucial elements in a rewarding and long-lasting romance. 10 Things We Know From Gottman's Research! 1. Gottman method couples therapy is 45% more effective than regular couples therapy. 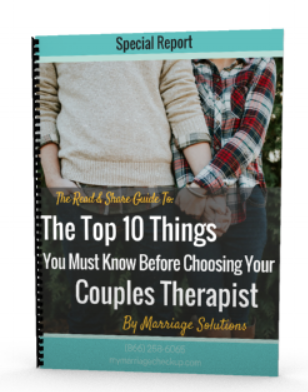 75% of couples “trying” a marriage counselor before divorce court report feeling happier in their relationship, and because they are happier they don’t call it quits. 2. It is based on over 40 years of scientific research. Where couples in good times and bad times were/are watched 12 hours a day to record everything they do including their heart beat. They are observed by cameras in an apartment lab that is set up like a bed and breakfast. 3. Because of the extensive research we now know what really makes a relationship work & what doesn’t make it work. I think you’d be surprised by the results. 4. It isn’t the problem you encounter but the way you talk about it, that is REALLY the problem between a couple. 5. The most important thing in predicating if a relationship won’t survive in 3 years with over 90% accuracy is the sign of CONTEMPT in the relationship. Contempt is feeling like someone is less than you as a person. The body language for contempt in all cultures is best described as having a fish hook in the left side of your mouth. It pulls your cheek to the side. I’ve noticed it this at times for split seconds in a session and it helps me understand just how troubled the marriage/relationship is in. 6. The strength of a couples relationship is based not on just one secret, but actually seven principles. 7. Improving a relationship is based on spending time with your partner each day to discuss the major events in their day. Doing this for 20 minutes a day you will be amazed by how much you’ll learn about your partner and how your friendship will blossom. 8. Arguing doesn’t lead to divorce or unhappy relationships. Its how you argue. Use a gentle start up when you start something that is sensitive. Don’t use a harsh start up. Remaining calm will work wonders. Gottman’s research has shown how a difficult conversation starts is how it will end. Meaning if you start on a harsh tone you will probably have little chance of getting what you want, and it will end harshly. 9. A couples friendship is their best predicator of lasting success. So don’t let the kids come between you, because when they turn 18 and leave, your marriage might leave with them. 10. 70% of couples experience a decreasing in relationship satisfaction after the birth of a child. This can be improved by having the husband increase his workload around the house, and learning to be more supportive of his wife’s and baby’s needs. 11. Bonus - Marriage counseling can improve your marriage.